Fiona Drummond, West Auckland Historical Society, will present on a topic which has a high sense of “déjà vu” in her presentation on Henry Atkinson: Engineer, Water Giver & Titirangi Icon. 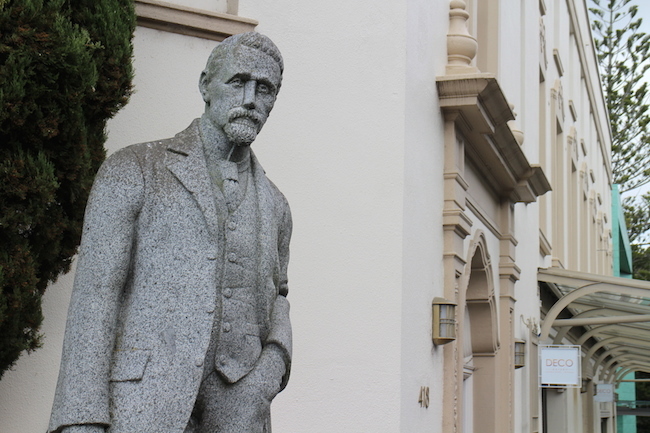 Henry Atkinson is one of Titirangi’s best known identities, surveying the village in various guises from his deserving pedestal outside Lopdell House. Yet how much is really known about this visionary ma? Around 150 years ago he made his first of several gifts to the city: an idea for a water storage dam, and the land to build one. His first idea was to locate it in Oratia. But then he sold and gifted land in Titirangi, where the current Water Treatment Plant is currently located. Today local residents grapple with the concept of the development of a new water treatment plant we must wonder what Henry is thinking. Image: Lopdell Precinct. Statue of Henry Atkinson. The conference is free, but registration is required as places are limited. Register here by 30 September.